When I read that artist Issa Samb passed away earlier this week, something compelled me to learn more. You know, it was one of those moments when you just feel you're about to discover someone or something that will become significant to you. 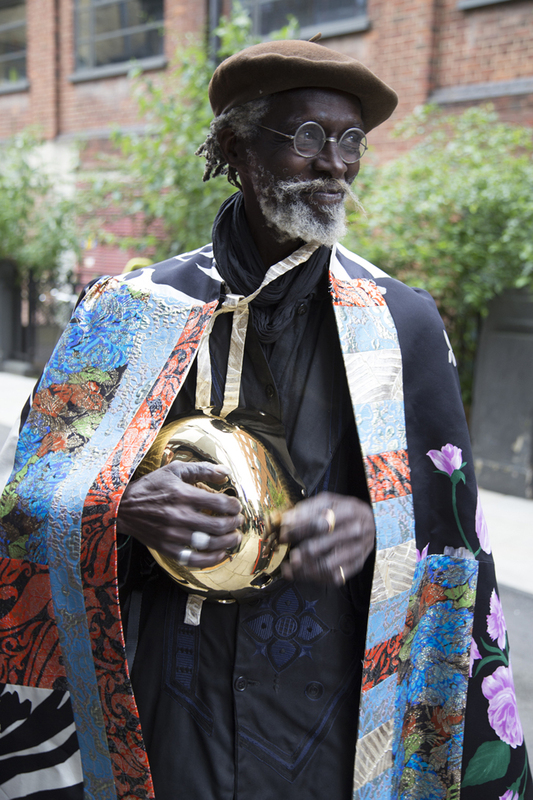 I've since learned that Mr. Samb was a philosopher, painter, poet, performance artist, visual artist, and patriarch-like figure in the artistic community in Dakar, Senegal who leaves behind a vast and significant body of work, some of which relates to our search for the essential in our relationship with our clothes. I came across this interview in which Mr. Samb discusses the meaning of objects, and ended up finding a treasure trove of insight about the nature of the things in our lives, presumably including what we wear and extending to everything we come in contact with. In a world of things, here is Issa Samb, helping us find meaning. Once we have an object in our possession, we begin to realize that there has to be a relationship between that object and ourselves. Trying to find out what kind of relationship this is means beginning to cross-examine ourselves and this attraction. Issa Samb, La Cour (The Yard), 2013. 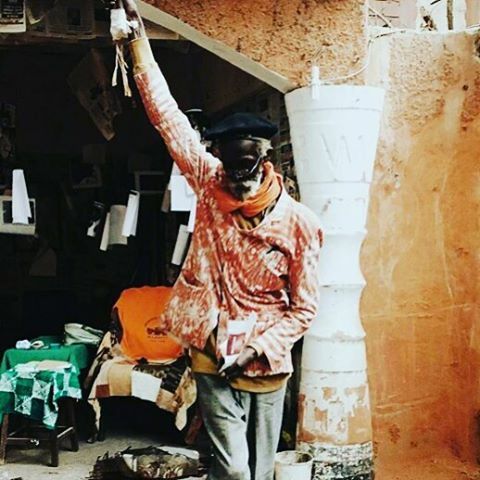 Installation in the artist's home studio in Dakar, Senegal. Photo: OCA/Asle Olsen. The fact that the object is mute- who says so? You do. You’re the one who decide[s] that the object didn’t speak, didn’t articulate and said nothing. But if all of this is true, then why do we need to carry objects with us in our lives? Why do we hold on to sandals that we’ve had since we were fourteen if they don’t speak to us any longer? And have never spoken anyway? No, they do speak. Objects speak. But they speak their own language. [Like} the wind speaks its own language, [and] birds speak their own language, objects speak their own language. Personally, I think that an object that was born in China and that makes the trip from China to Europe, from Europe to Africa, and from Africa to Europe, well, you can’t say that this object is meaningless. You just can’t. Even if you wanted to deprive it of meaning and make nonsense of it, you couldn’t. If you did, it would be an arbitrary, scientifically inadmissible decision. And if you did it simply for an intellectual peer group, or for some kind of aesthetic snobbism, of whatever nature, then you would be doing something very fascistic and dangerous. Because through the object, you would be denying the culture of the Other. You would be denying all its charge. No matter how small an object is, even an object that breaks quickly as it’s a mass-produced good by the Chinese, Japanese, or European market, it still brings with it the whole of China and beyond China. All of humanity...What moment in the historical time of China does it bring with it? It brings that moment in which China heads off in a new direction- down the capitalist road of development in the face of globalization. A globalization which doesn’t permit the polite rivalry of differential bows, the story of nice people. It is a ferocious rivalry. An object has to be ready to get onto the market quickly. You have to go in there fast to sell it. It has to break fast, so you sell it quickly in order to make money. That object there carries meaning. It teaches us about ideological situations, not just in China, but in the globalized world system: globalization as the dominant ideology of the current world. And on the subject of the objects we wear, Mr. Samb was, like Picasso, a believer in the uniform, which leads me to believe that in practice as in theory, certain objects spoke more loudly to him than others. I have a feeling I'll be revisiting these ideas a lot around here. In the meantime, I'll be taking a cue from the artist himself and celebrating his life. Mr. Samb's quotes from his interview with Antje Majewski. Source: Samb, Issa (2010). Personal Interview with Antje Majewski. Accessed April 28, 2017 via vimeo.